This entry was posted in New and Noteworthy Blog on March 20, 2019 by Lauren Pearson. How do we address the divided histories that define who we are? 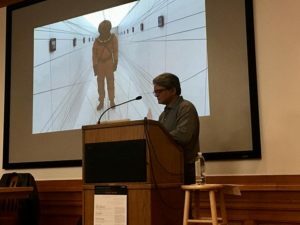 In November, 2018, Shuddhabrata Sengupta spoke about what it means to create art that addresses the entire human population. Representing Raqs Media Collective, a group of artists, curators, and editors who engage with many mediums and methods of artistic production, co-founder Sengupta explained the meaning behind the Delhi based collective’s name. In Urdu, the word “raqs” means dancing, a fitting title for a group that attempts to engage with a world in flux. As Sengupta went on to explain, their works are “kinetic contemplations”. In 2000, Sengupta, along with other Raqs co-founders Jeebesh Bagchi and Monica Narula, created Sarai, the Centre for the Study of Developing Societies. Sarai is a research based organization that explores urban life, including projects on media urbanism, intellectual property, art practice in the public realm, and more. Commenting on how influential Sarai’s projects have been to Raqs’ artistic practice, Sengupta said, “Research is the scaffolding that creates the structure for which the work can be made…eventually you have to take away the scaffolding”. Raqs attempts to grapple with a constantly changing and evolving world, situating an individuated self—a self comprised not only of multiple voices, but of multiple organisms—in relation to the histories and realities of others. “We are a million and a half people usually” Sengupta said, alluding both to the micro-organisms that comprise a single human body and the notion that we are constantly drawn into relation with people, perhaps not a million and a half people, but certainly more than we might realize at first glance. Thus, in order to address a multidimensional world, Raqs insists upon a kinetic analysis of urban life. To exemplify Raqs’ unique approach, Sengupta shared snapshots from a multimedia series of works on ghosts. Interested in the ways ghosts are double images or duplications of figures in different formats, Raqs created what Sengupta called “ghost” renderings of different spaces that allowed the viewer to interact with the digital environments. These interactive renderings are duplicate spaces and consequently contain duplicate histories, histories that are double images of their original counterparts. They explore the future possibilities of divisions created by history, namely the possibility to feel like a stranger in light of a history that is not one’s own. However, “Being a stranger doesn’t have to be negative”, Sengupta said, and thus the work becomes not about an insurmountable cultural barrier, but rather a matter of translation. Sengupta also spoke about Coronation Park, a public area in Delhi containing forgotten colonial objects including statues of King George V and Queen Mary. Sengupta centered colonialism as the starting place for a critique of a totalitarian history. Imperialism, he explained, was total and all encompassing. Colonialism functions importantly in Raqs’ work as the primary force that has written a history that alienates and others the people who were exploited by imperial powers, and Coronation Park, just a short distance away from Raqs in Delhi, acts as a reminder to “the inevitable hubris of power”. Traversing the rift between an already written history and lived experiences, while maintaining the belief in a present that is constantly in flux, like the dance from which Raqs takes its name, is the challenge that Raqs presents to its viewership, and in surmounting this challenge, we are forced to reconcile with ourselves the inconsistencies between our experiences and history. Event Description: Raqs Media Collective (Monica Narula, Jeebesh Bagchi & Shuddhabrata Sengupta) follows its self-declared imperative of ‘kinetic contemplation’ to produce a trajectory that is restless in its forms and methods, yet concise with the infra procedures that it invents. The collective makes contemporary art, edits books, curates exhibitions, and stages situations. It has collaborated with architects, computer programmers, writers, curators, and theatre directors, and has made films. It co-founded Sarai—the inter-disciplinary and incubatory space at the Centre for the Study of Developing Societies, Delhi—in 2001, where it initiated processes that have left deep impact on contemporary culture in India. Exhibitions curated by Raqs include ‘The Rest of Now’ (Manifesta 7, Bolzano, 2008), Sarai Reader 09 (Gurugram, 2012-13), INSERT2014 (New Delhi, 2014) and ‘Why Not Ask Again’ (Shanghai Biennale 2016-2017). Their work has been exhibited at Documenta, the Venice, Sao Paulo, Manifesta, Istanbul, Shanghai, Sydney and Taipei Biennales. Their prospective, ‘With an Untimely Calendar’ was held at the National Gallery of Modern Art, New Delhi, in 2014-2015. Other solo shows at museums include at the Isabella Gardner Museum (Boston 2012), CA2M (Madrid 2014), MUAC (Mexico City 2015), Tate Exchange (London 2016), Foundacion Proa (Buenos Aires 2015), Laumeier Sculpture Park (St Louis 2016), and the Whitworth Art Gallery (Manchester 2017). More information on the past event here.